Largest Selection: We have the largest selection of discount filters in all the top brands including their aftermarket versions for a less expensive price. 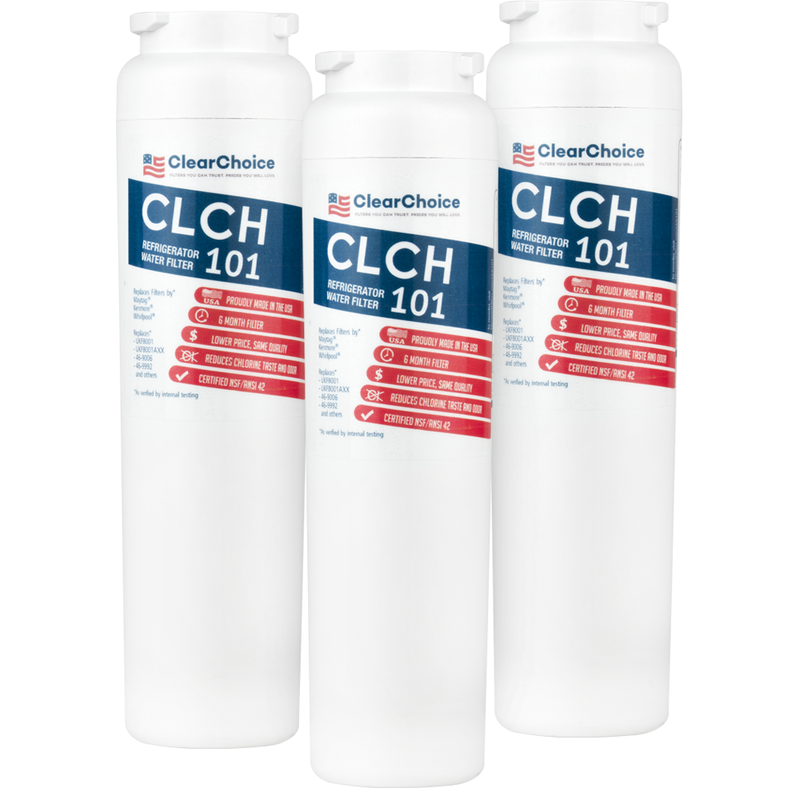 Replacing your refrigerator water filter regularly is an important and easy step in your home's maintenance routine. We highly recommend removing your old fridge filter and installing a new one at least every six months or sooner depending on how often you use your water dispenser from your fridge. Replacing your old refrigerator water filter can help remove harsh impurities from your fridge water and improve it's overall taste and smell. Tested & Certified: We carry big name brands like Whirlpool, Maytag, Frigidaire, Amana, LG and more. These filters are tested and certified to meet or exceed NSF/ANSI standards for filtering out contaminants from your drinking water. Discount Filters also carries aftermarkets of those name brand filters which filter out the same contaminants but at a lesser cost. We highly recommend trying our aftermarket fridge filters as they will cost you less but still give you the same great tasting, clean, clear drinking water. Cleaner, Better Tasting Water: Using activated carbon, our filters will absorb those potentially harmful contaminants from your drinking water. But over time that carbon does become less effective at capturing pollutants, and this is when we recommend replacing your filter. We carry name brand and our aftermarket filters in a 1 pack, 2 pack or 3 pack for additional cost savings. Fridge Filter Finder: If you don't know what kind of fridge filter you need, use our super simple fridge filter finder above. Simply select your fridge brand, fridge style, fridge filter location and removal type, and we'll show you the filter that will fit your fridge. It's as simple as that. You can also subscribe and get our fridge filters delivered straight to your home every six months so you never have to worry about re-ordering your refrigerator water filters again! Most Common Fridge Filters: Our top refrigerator water filters are the UKF8001, MWF, DA29-00020B, DA29-00003G, W10295370, 4396508, ADQ36006101, WFCB, WF1CB, WF2CB, 4396710 filter and more. All of these discount water filters fit a variety of refrigerator models, are easy to install and operate and are great filter replacements for name brand filters. Use the fridge filter finder above to select your brand of refrigerator and use the prompts to identify your exact refrigerator filter model.